A favorite doomsday scenario of the anti-carbon crusade hypothesizes that global warming, by melting frozen Arctic soils on land and the seafloor, will release billions of tons of carbon locked up for thousands of years in permafrost. Climate havoc ensues: The newly exposed carbon oxidizes and becomes carbon dioxide (CO2), further enhancing the greenhouse effect. Worse, some of the organic carbon decomposes into methane, which, molecule for molecule, packs 21 times the global warming punch of CO2 over a 100-year time span and more than 100 times the CO2-warming effect over a 20-year period. The fear, in short, is that mankind is fast approaching a “tipping point” whereby outgassing CO2 and methane cause more warming, which melts more permafrost, which releases even more CO2 and methane, which pushes global temperatures up to catastrophic levels. In a popular Youtube video, scientists flare outgassing methane from a frozen pond in Fairbanks, Alaska. 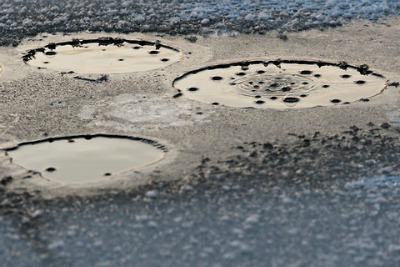 A photo of the pond, with methane bubbling up through holes in the ice, appears in the marquee for this post. Are we approaching the End of Days? New York Times science blogger Andrew Revkin ain’t buying it (“Methane Time Bomb in Arctic Seas – Apocalyplse Not,” 14 Dec. 2011), nor does his colleague, science reporter Justin Gillis (“Artic Methane: Is Catastrophe Imminent?” 20 Dec. 2011). [T]he authors found that roughly 1 meter of the subsurface permafrost thawed in the past 25 years, adding to the 25 meters of already thawed soil. Forecasting the expected future permafrost thaw, the authors found that even under the most extreme climatic scenario tested this thawed soil growth will not exceed 10 meters by 2100 or 50 meters by the turn of the next millennium. The authors note that the bulk of the methane stores in the east Siberian shelf are trapped roughly 200 meters below the seafloor . . .
And now for my two cents. 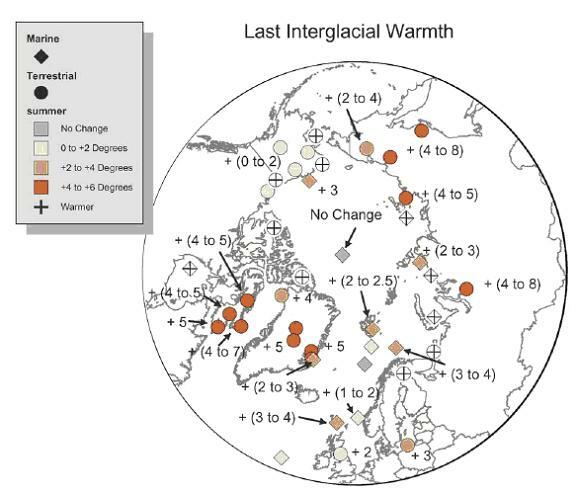 The Arctic was warmer than present for thousands of years during both the Holocene Climate Optimum (roughly 9,000 to 5,000 years ago) and the Last Interglacial Period (roughly 130,000 to 100,000 years ago). 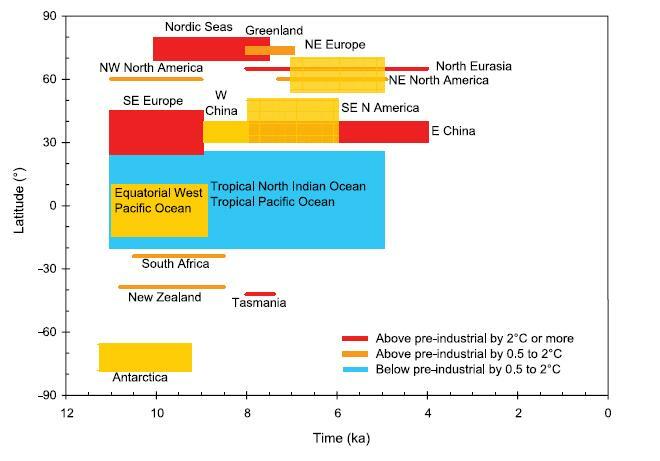 The chart below, from the IPCC’s Fourth Assessment Report (chapter 6, p. 462), shows that most places above 30N experienced greater-than-present warmth during the Holocene Optimum. Radiocarbon-dated macrofossils are used to document Holocene treeline history across northern Russia (including Siberia). Boreal forest development in this region commenced by 10,000 yr B.P. Over most of Russia, forest advanced to or near the current arctic coastline between 9000 and 7000 yr B.P. and retreated to its present position by between 4000 and 3000 yr B.P. Forest establishment and retreat was roughly synchronous across most of northern Russia. Treeline advance on the Kola Peninsula, however, appears to have occurred later than in other regions. During the period of maximum forest extension, the mean July temperatures along the northern coastline of Russia may have been 2.5° to 7.0°C warmer than modern. The development of forest and expansion of treeline likely reflects a number of complimentary environmental conditions, including heightened summer insolation, the demise of Eurasian ice sheets, reduced sea-ice cover, greater continentality with eustatically lower sea level, and extreme Arctic penetration of warm North Atlantic waters. The late Holocene retreat of Eurasian treeline coincides with declining summer insolation, cooling arctic waters, and neoglaciation. Average July temperatures along the Russian coastline “may have been 2.5° to 7.0°C warmer than modern” for two millennia. Such warmth was associated with “extreme Arctic penetration of warm North Atlantic waters.” Yet the greenhouse effect did not gallop away. Either clathrates did not melt en masse, or the bugs ate most of the methane before it could reach the atmosphere. 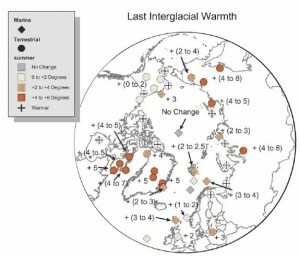 Turning to the Last Interglacial Period, Michaels and Knappenberger, in a separate post, review a study by the Circum-Arctic PaleoEnvironments (CAPE) project. The CAPE researchers conclude that summer air temperatures were “4-5°C above present over most Arctic lands” for thousands of years. So if Arctic warmth were capable of detonating a methane time bomb, it should have happened during the Last Interglacial. What do the data tell us? 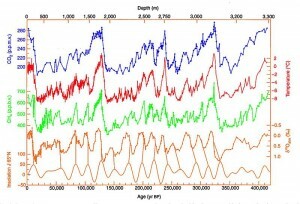 Vostok ice core data do show a correlation between changes in global temperature and atmospheric levels of both CO2 and methane. However, despite the sustained Arctic warmth of the Last Interglacial, there was no de-stabilizing, self-perpetuating spike in atmospheric methane levels. 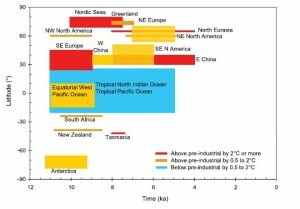 Global temperatures largely determined methane levels, not the other way around. 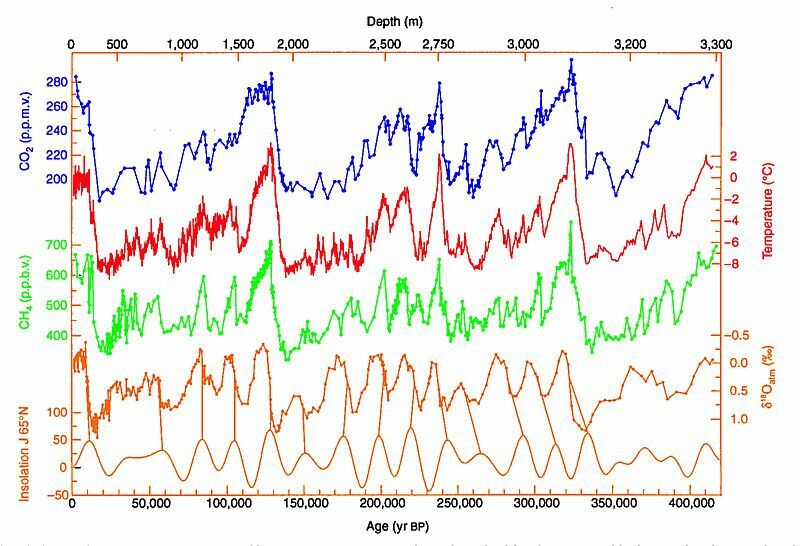 Atmospheric data going back 420,000 years indicate that the climate is more stable than alarmists assume. Even greater-than-present Arctic warmth sustained over thousands of years did not turn the permafrost or the seafloor into a climate-disrupting methane bomb. * Pat and Chip have been covering the permafrost scare since 2007 (here, here, and here). Guess Al Gore better to back to the 1970s “the world is cooling” scare!! ‘Edward A. G. Schuur, a University of Florida researcher who has done extensive field work in Alaska, is worried by the changes he already sees, including the discovery that carbon buried since before the dawn of civilization is now escaping. This, and in fact the whole tenor of his report, doesn’t suggest that Gillis sees no cause for concern in current developments in the Arctic.